After visiting a stadium, fans often leave online reviews on sites like Google, Facebook, Yelp, and TripAdvisor. In fact, there’s over 1 million such reviews for the stadiums in major American sports — which provides a potentially huge source of data that can tell us what it’s like to be a fan of different teams at different stadiums. This naturally leads to the question: What if all those rating scores, free-form text, fan sentiment, and data from online reviews can be analyzed in order to rank sports stadiums? And what exactly do the best stadiums do in order to deliver an exceptional fan experience? The company I work for, ReviewTrackers, recently gave me free rein to collect 1.5 million reviews of stadiums and do a statistical analysis to see if all this data can tell us more about what it’s like to be a fan. I started with Major League Baseball. Using natural language understanding algorithm, I analyzed the sentiment data in over 130,000 reviews for MLB stadiums and identified approximated 500,000 moments when fans said something either positive or negative about a particular stadium. For example, when someone complains about the trough-style restrooms at Wrigley Field, that shows up as a data point with a negative score. When someone raves about the Phillie Phanatic’s antics at Citizens Bank Park, that shows up as a positive. All of these moments were tied to a keyword (“hot dogs”, “seats,” etc. ), which allows me to score each MLB stadium for topics that fans talked about. I took the most common keywords, grouped them into four main topics — food and drink, facility, family friendliness, and fan experience — and averaged the sentiment scores for these topics. This allowed us to score each stadium for each topic, as well as provide an overall ranking for stadiums. As shown above, Oriole Park at Camden Yards ranks first overall and also boasts of the top-rated facility. It’s followed by PNC Park, which ranks first for families and fan experience. AT&T Park is third, while also ranking first for its hot dogs, and Safeco Field places fourth overall. The data also shows that overall fan sentiment at MLB stadiums has increased 17 percent over the last seven years, which means that, based on online reviews, teams are providing a better in-game experience than ever for fans. And while the hot dog is still the most talked-about food item at a baseball game (it’s six times more popular than anything else), barbecue is considered to be the best ballpark food. Fans are four times more likely to talk about enjoying their barbecue than they are their hot dog. One thing that will jump out to any baseball fan is that Wrigley Field and Fenway Park don’t score very highly by this metric. That was fascinating to me. 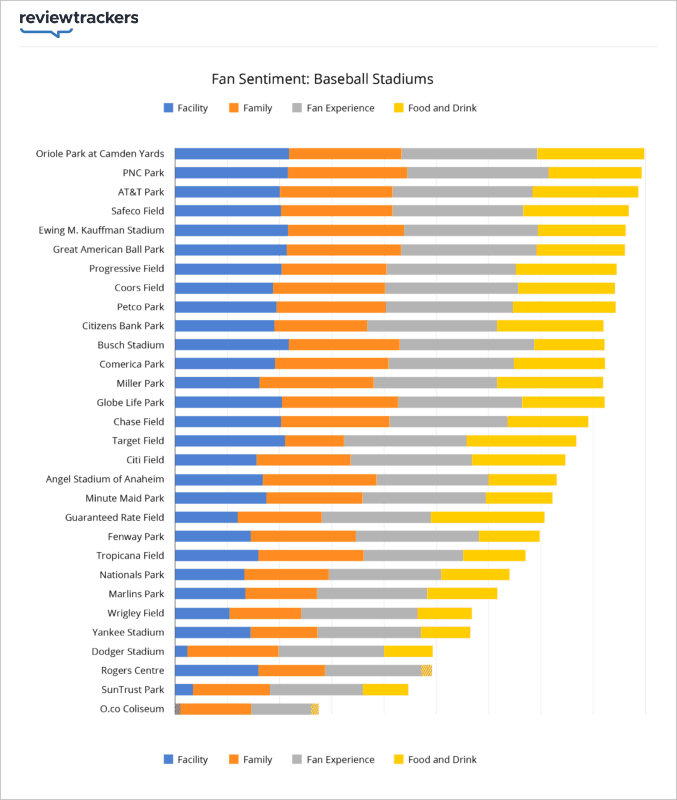 The data shows us that fans talk about their experiences at these stadiums negatively, even if they really enjoy it. So in other words, fans complain about the food, bathrooms, the overpriced tickets, and the lack of legroom — but that doesn’t really affect Wrigley or Fenway’s reputation as baseball cathedrals. NCAA football is a completely different experience than professional football, or other professional sports for that matter. When fans go to a college football game, they don’t talk about the food or in-game entertainment. They talk about tailgates, student sections, marching bands, and the traditions of the stadium. To analyze the way fans talk about NCAA football games, I tracked keywords related to these “school spirit” parts of the stadium experience. I gathered and analyzed data from over 140,000 reviews of 147 NCAA football stadiums, then used these findings to score each stadium for multiple aspects of the college football stadium experience. Texas A&M, Nebraska, and the Alabama Crimson Tide emerged as having the top three stadiums by star rating, which is a helpful way to look at the overall experience for NCAA football teams. But after diving deeper into the data and looking at keywords related to school spirit, I arrived at a few other interesting findings. The analysis shows that the Big Ten has the most school spirit in all of college football, narrowly edging out the SEC. Among major teams in the Big Ten, the University of Wisconsin-Madison ranked first for school spirit and had the top-rated band. In the data, you can see just how obsessed Badger fans are with the “jump around” tradition at the end of the third quarter. In their reviews, fans are more likely to talk about jumping around to the House of Pain classic than they are to use the word “Wisconsin.” Crazy, right? The Northwestern Wildcats, meanwhile, ranked first for most loyal alumni, with a higher percentage of stadium reviews mentioning alumni than any other team. For more details, read the 2017 NCAA Football Stadium Rankings “Voice of the Fan” Report. While I don’t claim these stadium rankings are more definitive than others, this research demonstrates the kind of insights you can gain by listening to what sports fans are saying online, unprompted, in their own words, via online ratings and reviews. By aggregating the voice of the fan, you can come to a few interesting insights. And next time you go to a baseball game, you may want to remember to try the barbecue.